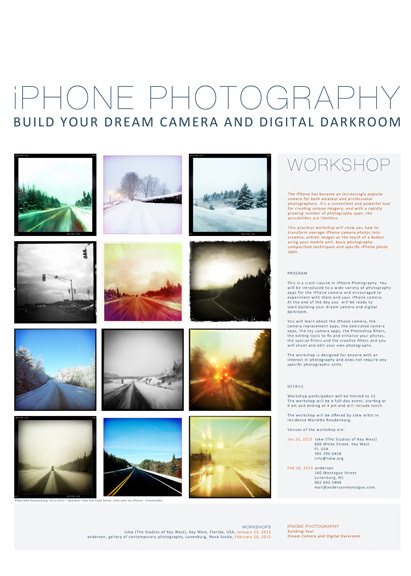 Two new iPhone workshops are scheduled for Saturday, September 14, 2013 and Saturday, September 28, 2013. The workshops start at 10 am and end at 4 pm. Lunch will be served. The workshops will be limited to 12 participants and cost $95 plus HST per participant. Workshop venue: anderson, gallery of contemporary photography, 160 Montague Street, Lunenburg, Nova Scotia, Canada. For more information or to apply for the workshop, please contact marietteroodenburg@gmail.com.